This new edition of a highly successful pronunciation text for high beginning to low intermediate ESL/EFL students covers the speech sounds of North American English, as well as common sound-spelling relationships, intonation, and stress. 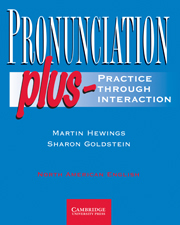 Pronunciation Pairs offers a variety of exercises and activities, from very controlled minimal pair and listening discrimination tasks to dialogs, games, puzzles and guided conversations. Each speech sound is presented with a list of high frequency words that include the sound as well as the common spellings used to represent it. Updated dialogs include current and useful vocabulary and introduce a theme for each unit. Hundreds of simple, clear illustrations help students understand the vocabulary and dialogs. A student Audio CD is included in the back of the student's book, and a student website offers additional exercises for use at home or in the lab.